The red light has to be the most universal of traffic signals. There is nothing subtle or confusing about its meaning. There is only one thing to do: stop. Yet red light running is one of the most common factors in crashes and fatalities, the numbers of which have been rising. 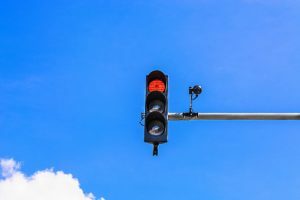 All states have traffic laws that specifically require “obedience to traffic control signals and devices” (or similarly-worded language), meaning that drivers must observe and obey all traffic lights and stop signs when operating vehicles. In 2016, more than 800 people died in incidents related to red light running, an increase of 17 percent from 2012. One of the main reasons, according to the Insurance Institute for Highway Safety (IIHS), is the lack of red light camera programs. Fortunately, we do have such a program here in Portland, where signs are posted on all major streets and ahead of each camera-enforced intersection. A violation occurs when a driver enters an intersection after the signal light has turned red. But Portland is one of relatively few. As of July 2018, just 421 communities across the country had red light camera programs, down from 533 in 2012. Commonly cited reasons for ending programs included a reduction in camera citations (tickets), financial issues and community opposition. Opponents often believe the cameras are not a safety measure, but a revenue-generating measure. But the IIHS says that the data supports the argument that red light cameras do indeed improve safety. The IIHS recently completed an analysis of national fatality figures, which prompted it to partner with several other safety organizations to develop a checklist to help communities create and maintain successful programs. “We developed the guidelines to help communities avoid the problems that have undermined programs in the past,” Harkey added. The checklist, which provides practical information and recommendations for planning, implementing and evaluating red light camera programs, including steps to help communities build and maintain public support, was released during the summer by the IIHS, AAA, Advocates for Highway and Auto Safety, and the National Safety Council. Red light running is one of the most common factors in urban crashes. More than half the people killed in red-light-running crashes are pedestrians, bicyclists and people in other vehicles hit by the red light runners. Should you be in need of a car accident attorney in Oregon, Zbinden & Curtis is ready to help. This entry was posted on Monday, September 24th, 2018 at 7:32 pm and is filed under Car Accidents. You can follow any responses to this entry through the RSS 2.0 feed. You can leave a response, or trackback from your own site.